The San Diego Gulls earned a third-place finish in the American Hockey League’s Pacific Division with a 4-3 victory Saturday evening at Tucson in the final regular-season game for both teams. 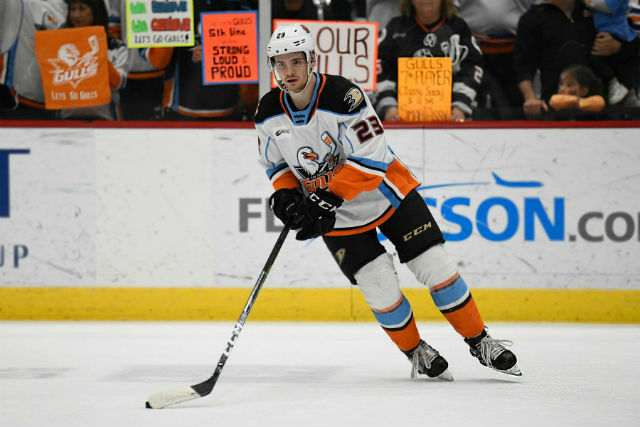 The Gulls will open the Calder Cup playoffs Wednesday by playing host to second-place San Jose at Pechanga Arena San Diego, where Game 2 of the best- of-five series will be played Thursday. Individual game tickets for the Gulls home games in the first-round series will go on at 10 a.m. Sunday at SanDiegoGulls.com/playoffs or by phone at 844-GO GULLS. Tickets will go on sale at Pechanga Arena San Diego at 1 p.m.
Tucson’s loss and Colorado’s 3-2 victory over San Jose dropped the Roadrunners into fifth in the seven-team division and out of playoffs, which the top four teams in each division qualify for. Coincidentally, three consecutive losses to Tucson to close last season kept the Gulls out of the playoffs. The Gulls broke a 1-1 tie with three unanswered goals. Sam Carrick gave the Gulls the lead for good with four minutes, 55 seconds left in the second period when he put a shot past Adin Hill for his 32nd goal of the season and 100th in 392 AHL games over seven seasons. Sam Steel put in a rebound for a power-play goal with 2:32 left in the second period. Adam Cracknell scored on a wrist shot with 14:14 left in the third period for his 15th goal in 32 games for the Gulls after being acquired by their NHL parent team, the Anaheim Ducks, Dec. 10, from the Toronto Maple Leafs in exchange for defenseman Steven Oleksy. The Roadrunners cut the lead to 4-3 on two goals by Connor Garland, the first with 13:56 remaining and the second with 1:14 left when they were on the power play and had a sixth skater after Varady pulled Hill for the extra attacker. The Gulls were outshot 38-20, including 15-8 disadvantages in the both the first and second periods. The Gulls killed five of Tucson’s six power- play opportunities and scored on their only power-play opportunity. Jeff Glass made 35 saves for the Gulls. Hill made 16 saves before a crowd at Tucson Convention Center Arena announced at 6,521. Following a scoreless first period, Gulls center Ben Street began what would be a three-point night with a goal 4:36 into the second period. He later assisted on the goals by Carrick and Cracknell. Tucson tied the score 11:06 into the second period on Lane Peterson’s goal.